Unlike many professional fields, “leadership” in social work doesn’t necessarily refer to social workers’ managers or supervisors. “Social workers use a more generous definition of leadership,” explains Tara La Rose, an assistant professor in McMaster’s School of Social Work. In her field, leadership means taking the initiative to work for change and the core value of social justice. It means challenging existing power systems. Social workers know that they will come up against societal limitations that leave people on the margins. But there’s also tension between the rules that govern their own profession and the reality of their work. For example, social workers tend to stay away from digital communication, because they work for agencies or the government, who consider social media, apps and text messages too risky or informal a way to communicate with clients. La Rose, who was a field worker for more than a decade before joining the faculty at McMaster, hopes her teaching and research will address that tension and demonstrate that social workers can engage with clients and the community by using digital communication in ethical ways that actually extend their reach, rather than limiting it. McMaster is a natural fit for this kind of work, La Rose says: The School of Social Work is one of only two schools in the country to offer a master’s degree in social work leadership. In addition to teaching graduate courses on social work leadership, La Rose runs digital storytelling workshops at the Hamilton Public Library’s makerspace, where social workers and students learn to create videos explaining their vision of social work leadership. The workshops are part of an interdisciplinary research project La Rose is leading in collaboration with DeGroote School of Business professor Brian Detlor. The two hope to build a repository of videos that will create a better understanding of what social work students and field workers think they need to become leaders or drive change. But social workers have a huge wealth of knowledge gained from years of field work and experience, and students of social work often have a strong understanding of the injustices they want to address. La Rose wants to capture these stories and ideas and expand people’s perspective on what it means to be a leader in social work. “We’re giving folks an opportunity to think about how you can use a medium, like digital storytelling and YouTube, as a way of conveying a message that might help other social workers or the population that you’re working with,” she says. And the video projects have been as varied as the students creating them. “One student created a story talking about national identity and colonialism, and how being a leader in social work means trying to challenge a nation-building project that is largely focused on whiteness,” La Rose says. Eventually, the videos will become part of the Love Your City Share Your Stories digital storytelling project, which Detlor has been involved in from the start. Like La Rose’s project, LYCSYS is a repository of video stories — these ones created by Hamilton residents, about their experiences living in the city. 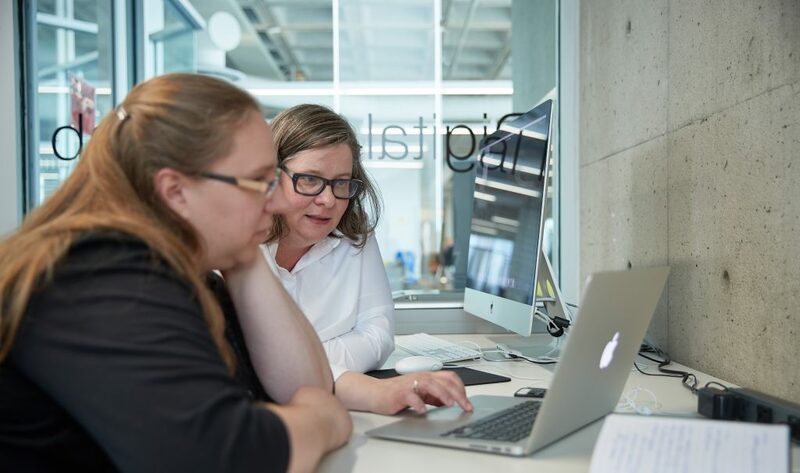 “Both of us thought these digital storytelling workshops are a great vehicle to create a fun experience for people to embrace technology, learn digital skills and offer their insights,” Detlor says. Though their research and interests are similar, and their office buildings are beside each other, Detlor and La Rose hadn’t met until he approached her to ask if she would like to collaborate and apply for an interdisciplinary research grant the university offers. “The grant gave us the opportunity not only to do research in our shared interest, but also to get to know one another, and it’s working really well,” Detlor says.